VANCOUVER, B.C. - The New England Revolution made a rare cross continent trip to Vancouver as they battled Whitecaps FC on a sunny Saturday afternoon. It was the Cristian Techera show as the Caps winger scored a second half, hat-trick in a fast paced exciting 3-3 draw in front of 22,120 spectators at B.C. Place. The Revs opened the scoring in the first half off an own goal from Aly Ghazal. Cristian Penilla scored just after the re-start to put New England ahead 2-0. Cristian Techera answered back with two quick goals setup up by Canadian internationals, before Canadian born, Teal Bunbury put the Revs ahead a 3-2. Techera completed his hat-trick off a cross through the New England box that nobody could clear. Each team settled for a point. New England improves to 5-4-3 on the season as they get set to host Atlanta United FC on Wednesday night. 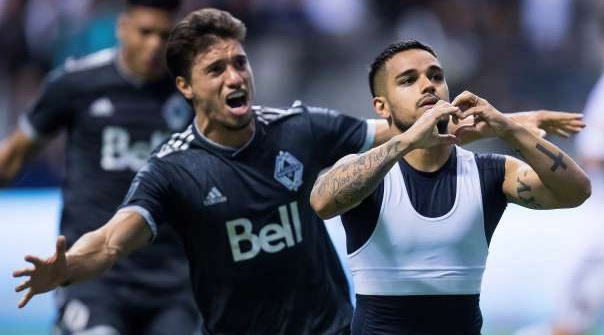 Whitecaps FC hold firm with a 4-5-5 record after a fourth consecutive draw. "We showed good character," Carl Robinson told reporters post-match. "I know I’ve got character in that group. We didn’t go under, it would’ve been easy at 2-0, when there were a few moans and groans, and rightly so. The players stuck together. They find a way back into the game and ignited the crowd. We ourselves to 2-2 and déjà vu again." "It was a frustrating one." Diego Fagundez admitted. "We did so well to get a goal early and come back at halftime and get another one; then everything just turned around on us. It’s an awful feeling right now. We have to take what we got. We’re going to go home and prepare for our next game." Kei Kamara had a glorious opportunity to open the scoring against his former team. Yordy Reyna played a terrific ball across the goal, Kamara took a poor touch, and by the time he delivered a shot on target. Matt Turner came diving across his goal to make a spectacular save to keep the Revs out of danger. Whitecaps FC midfielder Aly Ghazal made a surprise start for the Caps at centre-back. The Egyptian international didn't get off to a good start as he deflected a New England cross from Cristian Penilla directly into his own net in the 26' minute. “Aly has trained very well." Robinson said. "I wanted to keep the two midfield players in there together because I thought they did very well together at Dallas last week. I need to get Aly a game as well, with Kendall going away. Aly and (Aaron) Maund are going to come into contention. I thought Jose Aja needed a rest. I thought Aly did really well at certain times. He scored the own goal because he didn’t move his feet quick enough. That happens at times. His next clearance was good." Own goal Ghazal. New England lead 1-0. Neither team could muster much of any offence in the opening half. New England played a high press that Whitecaps FC had trouble breaking down. The Revs controlled the play, and did well to keep the Vancouver attack at bay. Whatever was said at the interval worked as both teams came out with offence. The Revs doubled their lead in the 47' minute as Penilla broke down the right flank, and out-muscled Sean Franklin. The Ecuadorian striker slide the ball past Rowe to make it 2-0. The Revolution quickly collapsed in the 49' and 51' minute when Cristian Techera scored a pair of goals to even the match at 2-2. Marcel de Jong found Techera at the far back post and he volleyed the ball off the pitch and past Turner. Moments later, Russell Teibert found Techera in front of goal and he converted to the delight of the Vancouver crowd. As fast as Whitecaps FC got back into the match they gave up another shocking goal in the 59' minute. Teal Bunbury was left unmarked with all sorts of space. He scored his team leading 6th goal of the season after a fantastic cross from Diego Fagundez. Undeterred Vancouver pressed forward-looking for another equalizer. Once again, it was Cristian Techera to the rescue as the Uruguayan magician scored his 5th goal off the season off a Yordy Reyna cross in the 74' minute. It took some time but, both teams came to play in a highly competitive match. Defence was thrown out the window, and both teams brought their offence. Each team was deserving of a point on the day. It was a class of offence and not much else. The New England Revolution had no answer for El Bicho, as Cristian Techera was in the zone against a helpless New England back-four that could not mark him. Techera made terrific runs in behind the Revs defence, and was in perfect position for each of his goals. The Revs were caught out several times, and Techera took full advantage of his opportunities. Techera was the primary factor in Vancouver earning a valuable point. "I felt extremely happy that we tied the game up but unlucky that we weren’t able to win the game." Techera said post-match.